In less than a week I will be heading to Burkina Faso again but this time to take part in SICOT, the 1st edition of the International Cotton and Textile Fair (SICOT) an essential conference and platform to further boost cotton processing on African soil. A space for exchanges and reflection, the show will bring together cotton specialists and industry experts and professionals from across the value chain around the concerns and development opportunities of the conventional and organic cotton sector with an aim to create networks to build a textile production value chain in Burkina Faso. SICOT will also be a forum for the valorisation of modern tools for financing, production, transportation, processing (spinning, dyeing, weaving, hosiery) and marketing of products. Read more about that upcoming program here and stay tuned as I give highlights from that trip. 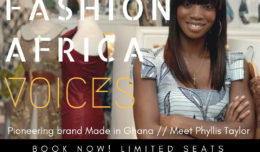 In light of this upcoming trip to Burkina Faso, I wished to highlight to you a designer who has had an amazing journey building a fashion made in Africa business using local fabrics, textile techniques and production. 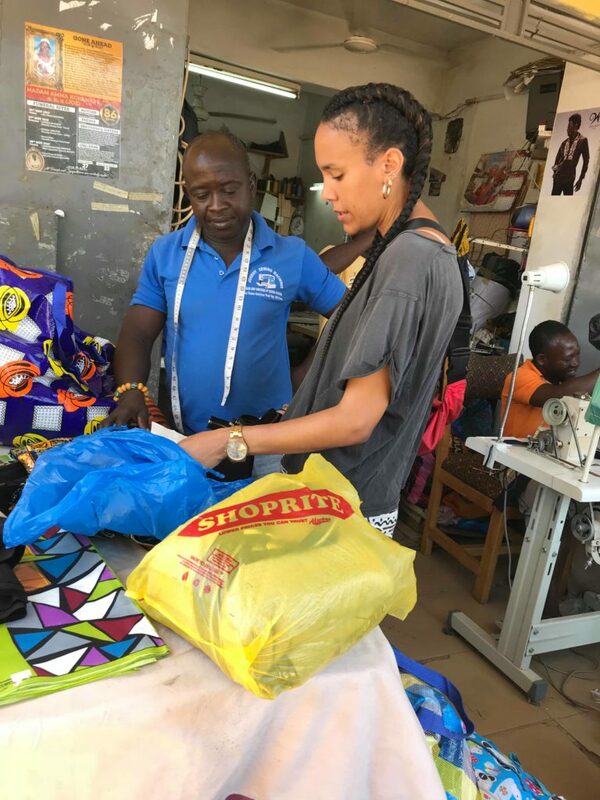 I asked the founder Victoria Pettersson Henry to give the Africa Fashion Guide community insight into producing fashion product in Africa and utilising local textiles. By working with independent small-scale business owners such as fabric wholesalers, tailors and seamstresses, the brands become defined by a fusion of natural and man made materials, the collections are inspired by travels, indigenous tribes and cultures and are always handmade with love. 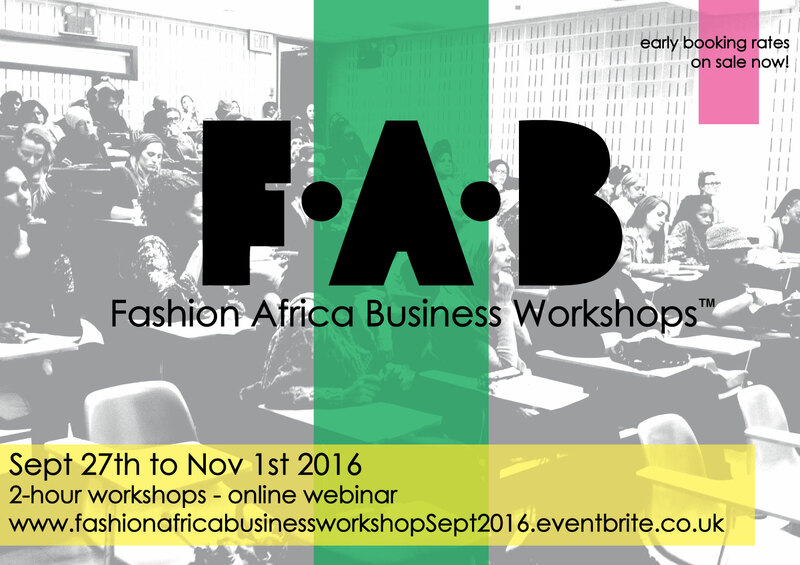 I guarantee you will be inspired to set up your own brand in Africa! 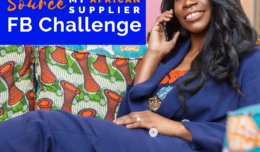 If so do click the link https://calendly.com/jacqueline-shaw-your-african-fashion-business-coach to jump on a call with me, Jacqueline Shaw Your African Fashion Business Coach to help you set up your brand with ease. I wake up for the second time – the first time being 5am when the Mosque next to my house calls to prayer, which I always find quite soothing. After a quick shower, a cup of coffee and a mango for breakfast I walk through the village to get to the main parking lot aka “the station” where I’ll catch a Tro-Tro to central Accra. The Tro-tros are old vans, usually brought from Europe and rebuilt to fit about 20 passengers. It’s a long and sweaty ride, especially at this time in the morning when everybody is getting to work and the traffic is packed. 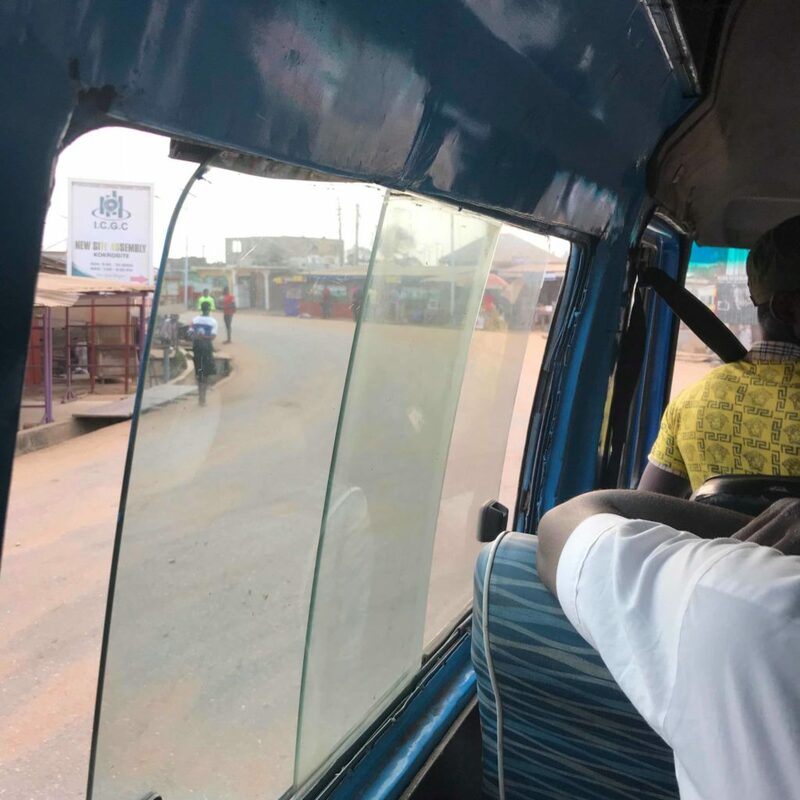 I’m finally at Makola market, after having changed from a Tro-tro to a regular bus halfway at Kaneshie. There are no words that could really describe the busy and vibrant Makola market – most people would probably call it chaotic. It’s the main market of central Accra where you can get anything from textiles to food items, clothing, medicinal herbs and building material. It’s also where a lot of the fabric vendors around the city get their fabrics as there are many places selling wholesale, which is of course why I am here. After six times in Ghana I know which areas are usually the best spots to dig, but somehow I always end up getting lost in the labyrinth that is Makola market. There are endless alleys with piles of colourful wax print fabric printed both locally and abroad. 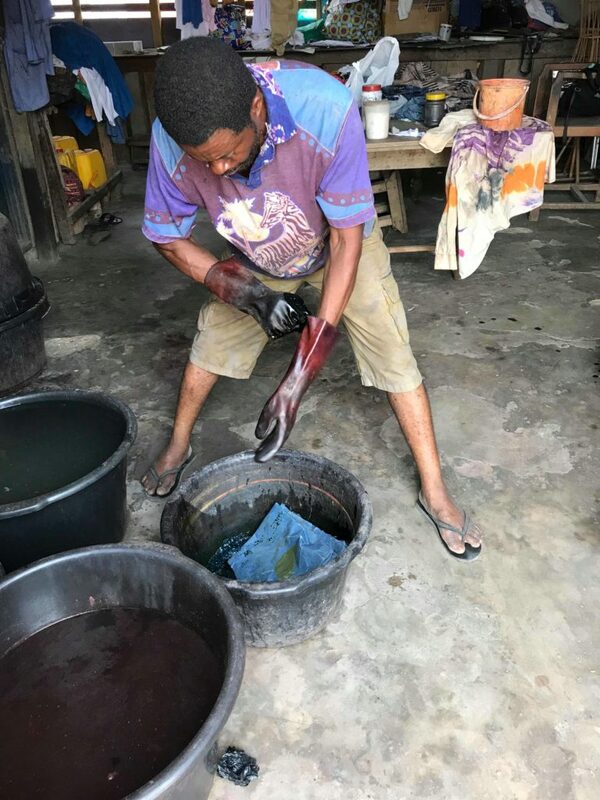 Today the Chinese copies of wax print fabrics have taken over the majority of the market, but there are still local print houses that create original prints, both here in Ghana and as well in the neighbouring country Ivory Coast. I’m quite picky when it comes to which prints and colours I like, and unfortunately sometimes the prints I fall for are just not available in big quantities. Sometimes I get it anyways and do very limited collections where there might only be 3-5 of one style. Lately I’ve been working more with artisans to produce batiks and woven textiles that could be re-made if I need more. When I’ve walked around in circles enough times to fill my backpack (with about 36 yards of fabric) I walk towards my go-to lunch spot Asaase Paa, not far away from the market. It’s a vegan restaurant which feels like an oasis to a vegetarian in a meat-loving country. I pass by the Art Center (which is a market) nearby to pick up some hand-dyed & printed fabric that I’ve had produced by a batik artist. The Art Center is the main place for tourists to get typical souvenirs, and the front part of the market is quite tiring to go through with all the sellers trying to get you to buy their colorful Dashikis or name bracelets. But in the back area you’ll find lots of genuine workshops and ateliers of artisans doing everything from wood carving to brass smithing, batik-printing and tailoring. Over the years I’ve gotten to know quite a few talented artisans here that I’ve worked with for my collections. Some of my brass jewelry and hand-dyed fabrics have been made there. I have to pass many small shops in the back before I reach the batik-workspace. I’ve ordered a few different samples from my designs and some of them are hanging outside to dry. 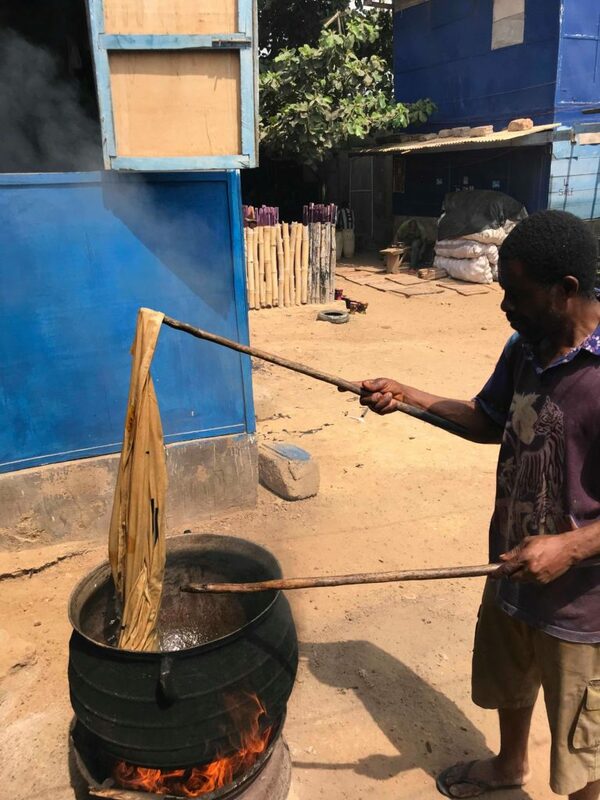 Winfred, the batik guy, is still putting some fabrics in a huge pot with water, boiling from the fire beneath, to remove the wax used during the printing process. After that he washes the fabric by hand in a bucket to remove any excess wax. They dry quite fast in the sun and after ironing I pack them in a tote bag and head towards my ride home. I’m tired from the heat and two heavy bags, and I want to get back to my beach town outside of Accra before the afternoon rush-hour sets in. I get back to Makola market and get on a already cramped Tro-tro trying to fit both bags on my lap. After falling asleep in the Tro-tro, almost missing getting out where I had to change to a shared taxi, I’m finally back at the village station. My first times in Ghana I stayed in Accra and only came out here when I had to visit my tailors that are located out here, but I soon realized I preferred it the other way around. I now stay in Kokrobite, a small, laid-back village by the ocean only going to Accra when I have to get textiles or visit the artisans at the Art market.. Out here the air is cleaner, the breeze is cooler and I can spend my free-time taking surf classes with Mr Bright or just hangout at the beach. The weekends are a little bit more busy as people come out here from the city – both Ghanaians and expats love to spend their days off by the beach. After a cold shower to cool down and get rid of the dust from the city I just relax at home for the rest of the night, preparing a salad and reading a book. After a day in the city I’m usually too exhausted to do anything else and I fall asleep quite early around 9.30pm. After a long sleep-in, and a slow morning on the porch, I bring yesterdays fabric founds to my main tailor Emmanuel to start working on some new styles. Emmanuel is a hard-working man, working early mornings until late evening, supervising his team of tailors – both employees and apprentices. We’ve been working together since 2014 when I first visited Ghana, and we’ve developed a way of working that suits us both, understanding each other better and better each time. It’s been hard coming from a completely different culture where we focus more on certain details that are not seen as important here. Most tailors are used to sewing unique pieces for their customers, not having to care that each piece have to look the same as the next. There have been many misunderstandings and mistakes during the years, which makes me appreciate the outcome even more when everything goes right. There’s literally been a lot of blood, sweat & tears shed (by me! Not the tailors…well they sweat a lot too…who doesn’t, it’s Ghana!). I’m back in the house to cook up a lunch with some veggies I bought on the way back.. A salad and some freshly squeezed juice is on the menu today and I enjoy it in the shade of the porch, in front of our big garden full of Neem and palm trees. 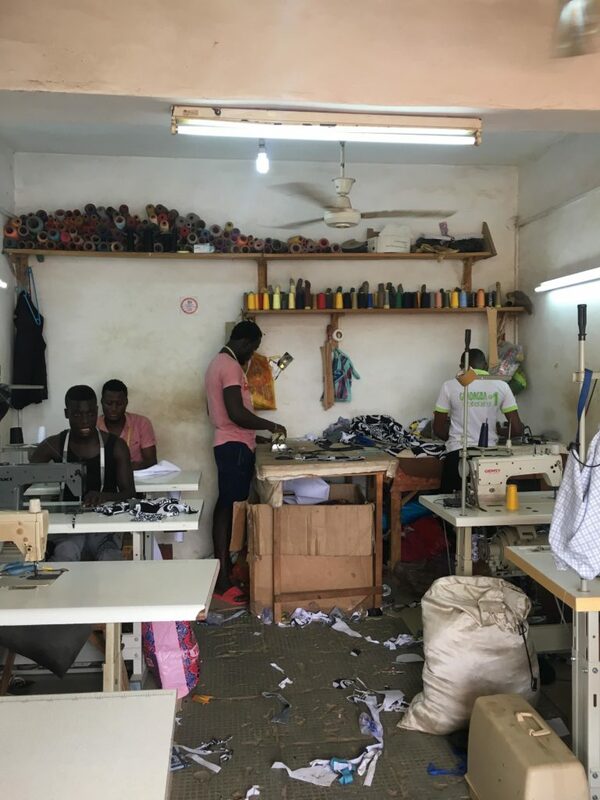 My production assistant Siaka sends me a text message with pictures from our production in Burkina Faso, where I’ve also been working with artisans since 2016. Siaka lives there and his cousin is one of the tailors who makes my bags and accessories. 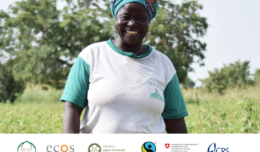 We’re also working with women who weave Faso dan Fani – the national cloth of Burkina Faso – in their homes on the outskirts of Ouagadougou (the capital of Burkina). We definitely work on a grass roots level, without any middlemen or organizations. We passed by these women working in front of their houses, when visiting some of Siaka’s relatives, and we simply asked them if we could order some designs from them. Before weaving they also dye the cotton threads and prepare the warp and weft. 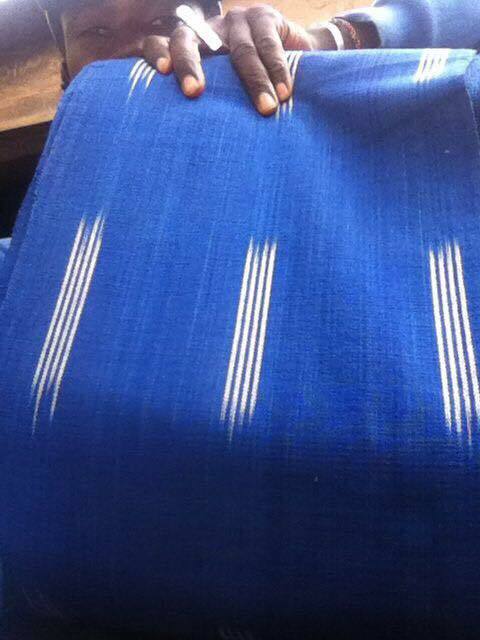 Siaka has now sent me some images from a new blue style we’re working on. 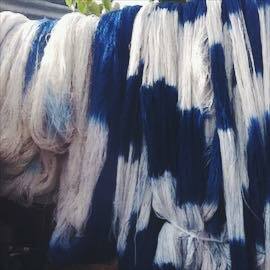 The style is Ikat, which is a technique where the yarn bundles are tightly wrapped in a special way before dyeing, in order to get a specific pattern later on when weaving. This technique is used in many parts of the world where weaving traditions are strong. In the evening I walk down to the beach where there is cultural drumming and dance shows during the weekend. The beach restaurants are a lot busier during the weekends when people from Accra come out to relax and enjoy beach life. I meet up with some friends from the village and enjoy a few drinks and live music for the rest of the night. After getting back to the house and had a quick shower to get rid of the salt and sand I get ready to visit Emmanuel again and check out some samples he’s made from the fabric I dropped off yesterday. The tailors are always happy and joking around and you can tell they enjoy their work. I’m happy with the trousers and jacket that they’ve made, and I bring them with me to try them on and check the details closer when I’m back in the house. Yup, I use myself as a fitting model most of the times, not always ideal but it works most of the times. I’m getting hungry since I haven’t had anything to eat since the morning, and I also have some work to do on the laptop, so I bring it with me to the Italian restaurant & guest house and order my favorite eggplant pasta and lemon ice tea. The place is a really lush garden, with all kinds of trees and birds sitting in them. The place is owned by an Italian/Spanish couple so the food is as authentic as it gets outside of Italy, and I can get my weekly dose of cheese/cream/good bread or whatever I crave at the moment. Unfortunately I’m not a big fan of Ghanaian food, which makes life eating quite boring for a foodie like me whenever I’m in Ghana to work. Most of the time I cook at home, but once in a while I enjoy treating myself to some Italian goodness and this place is also excellent for relaxing and just having a quiet place to work at. I send off some invoices and start designing some new business cards that I will order from a print house when back in Europe. The rest of the evening I just relax at home, checking the new samples I brought back and reading a good book before sleep. Tomorrow is a new day, and there’s always some work to do… I feel blessed to be able to do what I love while also skipping the Swedish, freezing winter – but I’m also looking forward to go back and release this new limited edition collection that is slowly coming together in a few weeks. Can’t wait! 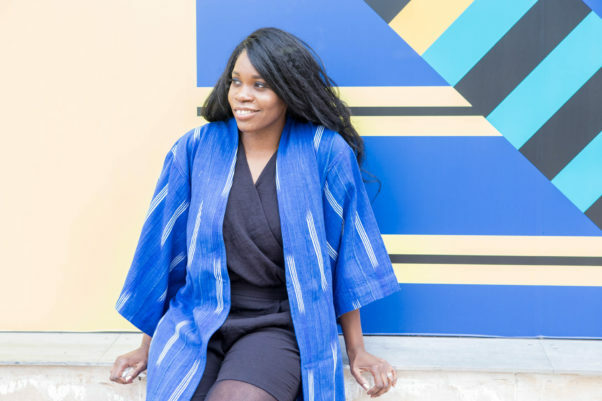 I totally loved this insight so much I bought one of the coats made using Burkina Faso Dan Fani textiles! If you loved it as much as I did than do check out more from the brands Victoria Henry as well as Henry Rude. 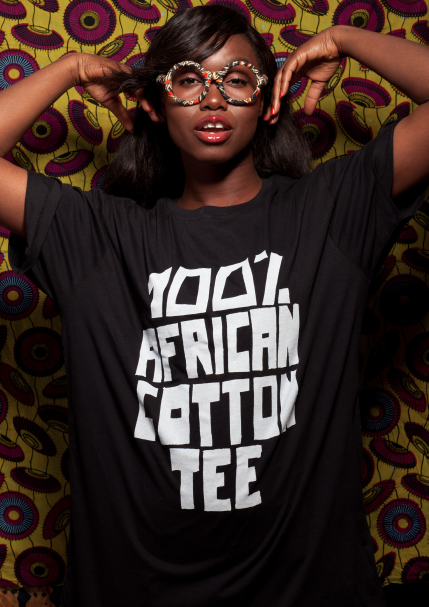 and their online shops too to get your own piece of Ghana and Burkina Faso in your wardrobe. and we will discuss how I can help you reach your goals and make it happen. Big thanks to Victoria for sharing her brand insider journey with us!